Technicians huddle near NASA's InSight Mars lander to give the go-ahead for testing of the craft's solar arrays. LITTLETON, Colo. – NASA's next Mars lander is in the final phases of preparation before heading to California's Vandenberg Air Force Base, where it will become the first interplanetary mission ever to launch from that site. The InSight Mars lander (the name is short for Interior Exploration using Seismic Investigations, Geodesy and Heat Transport) recently underwent its last checkouts here at Lockheed Martin Space Systems Co., which built the spacecraft for NASA. The spacecraft is scheduled to launch on May 5 on a United Launch Alliance Atlas V rocket, and arrive on Mars in late November. As InSight's solar arrays unfurl, test engineers carefully inspect their deployment. On Jan. 23, engineers unfurled InSight's solar arrays in a landmark test. 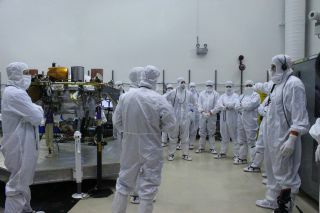 Technicians in clean-room garb carefully monitored the arrays as the arrays were fanned out in two large circles. The sequence started with loud pops as heaters on InSight warmed up the paraffin wax that releases the arrays. Then deployment motors kicked in, clicking and locking the arrays into place in a few minutes' time. The test verified the exact process InSight will carry out on the surface of Mars after it lands. By using a tower of bright lights to illuminate the arrays, test engineers confirmed that the arrays were churning out power. "This was our last major test before we start building up into a launch configuration," said Scott Daniels, manager of the assembly, test and launch operations (ATLO) phase for InSight at Lockheed Space. Following the test, the dual arrays will be re-stowed for the spacecraft's trip to Mars. Space.com's Leonard David, on the floor with the Mars-bound InSight spacecraft, talks with Bruce Banerdt, InSight principal investigator. InSight passed its solar-array test with flying colors, Daniels said. The next phase for InSight involves attaching its three landing legs, a parachute cone, a backshell and other hardware. "One month from now we're going to be all stacked up in the launch configuration and inside a shipping container headed out to California," Daniels said. InSight's roughly 30-day launch window opens May 5, when the lander will be boosted into space atop an Atlas V 401 rocket. After a six-month journey through space, InSight will make a rocket-powered touchdown on Mars on Nov. 26. The landing zone is within a flat stretch of western Elysium Planitia, near the Martian equator. A close-up view of InSight, topped with the Seismic Experiment for Interior Structure (SEIS), a seismometer provided by France's Centre National d'Études Spatiales (CNES). The upcoming trip to Vandenberg will be InSight's second trek to California. In December 2015, NASA called off InSight's original launch attempt planned for 2016. That no-go decision was sparked by unsuccessful attempts to repair a leak in the Seismic Experiment for Interior Structure (SEIS), a seismometer provided by France's Centre National d'Études Spatiales (CNES) – the French space agency. SEIS is critical to InSight's on-the-planet duties. But during testing, the instrument failed to hold a vacuum. Engineers with CNES and JPL combined their expertise to fix the SEIS woes. Powerful lights were used to illuminate InSight's solar arrays during the final test. Today, InSight's SEIS instrument is working just fine. Just ask Bruce Banerdt, InSight mission principal investigator at NASA's Jet Propulsion Laboratory (JPL) in Pasadena, California. He was on hand at Lockheed Space for the recent solar array test. "I'm ecstatic," Banerdt told Space.com. "Everything has been coming together really smoothly." The testing of SEIS, the Heat Flow and Physical Properties Package (HP3), provided by the German Space Agency, as well as the Rotation and Interior Structure Experiment (RISE), led by JPL, have gone flawlessly, Banerdt said. "The spacecraft has performed without a hitch. It has been like clockwork," Banerdt said. "I come out here and look at it every once in a while, just because it gives me goosebumps. But mostly I try to stay out of the way of the people who are actually doing the work of putting InSight together. "I'm in awe of the job they've done," he said. Leonard David is author of "Mars: Our Future on the Red Planet," published by National Geographic. The book is a companion to the National Geographic Channel series "Mars." A longtime writer for Space.com, David has been reporting on the space industry for more than five decades. Follow us @Spacedotcom, Facebook or Google+.